Looking for the best swaddles for your baby? 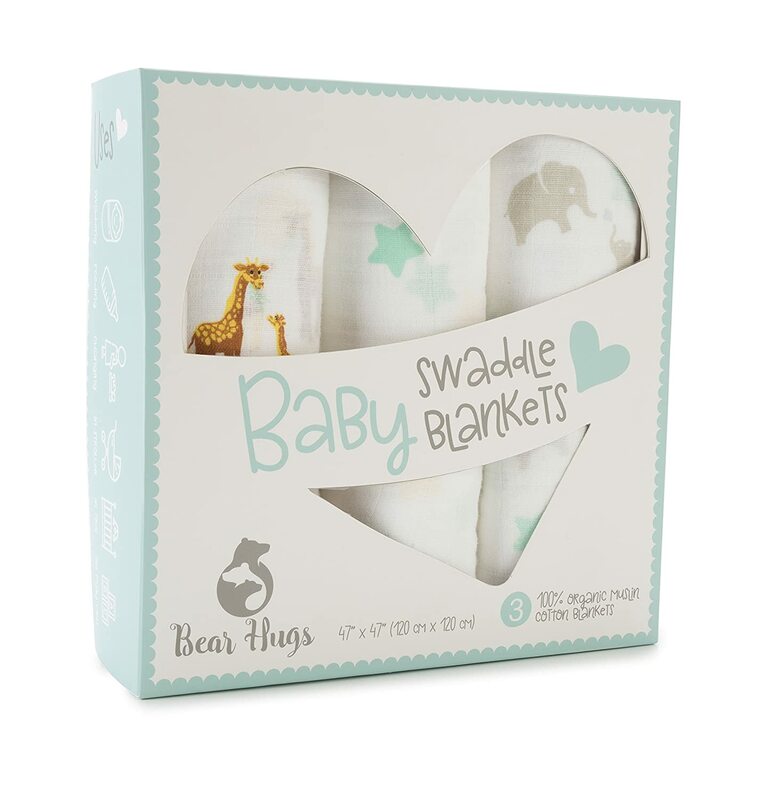 Here’s a list of the best organic swaddles as well as other swaddle options for your baby. In this section, we’ll cover what your baby wears to sleep with an extra focus on swaddling newborns. Since babies spend so much time sleeping, it’s wise to choose organic sleepwear and swaddles whenever possible. 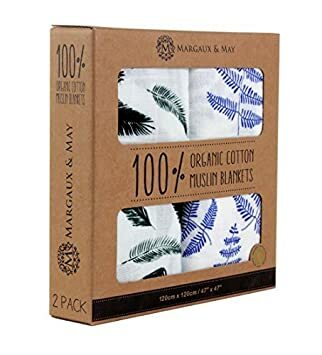 My recommendation is to try and choose organic cotton whenever possible for any item that comes into direct, prolonged contact with your baby. And sleepwear definitely falls into that category. Why Should You Swaddle a Newborn? The American Academy of Pediatrics recommends keeping your baby’s room at a comfortable temperature (roughly between 68 to 72 degrees Fahrenheit), and suggests swaddling your baby. What your baby wears beneath their swaddle blanket will vary based on the weather. If your house gets warm during the summertime, you may just dress your baby in a bodysuit or even in just their diapers. In moderate temperatures, I like to dress my baby in a short-sleeved bodysuit and pants. If you live in a cooler climate, footie pajamas will help keep your baby from getting too cool. I prefer the zip-up version over the button-up kind, but they’re not always easy to find. Cotton is preferable since it’s a breathable fabric. 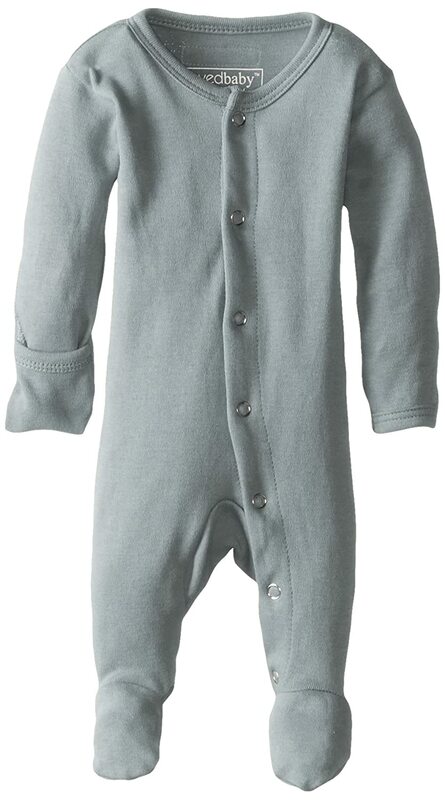 My favorite footie pajamas are Burt’s Bees Baby’s 100% lightweight organic cotton zip-up footed pajama. Under the Nile makes some adorable and slightly heavier weight footed pajamas. Hanna Andersson makes high-quality PJs, but they are footless. 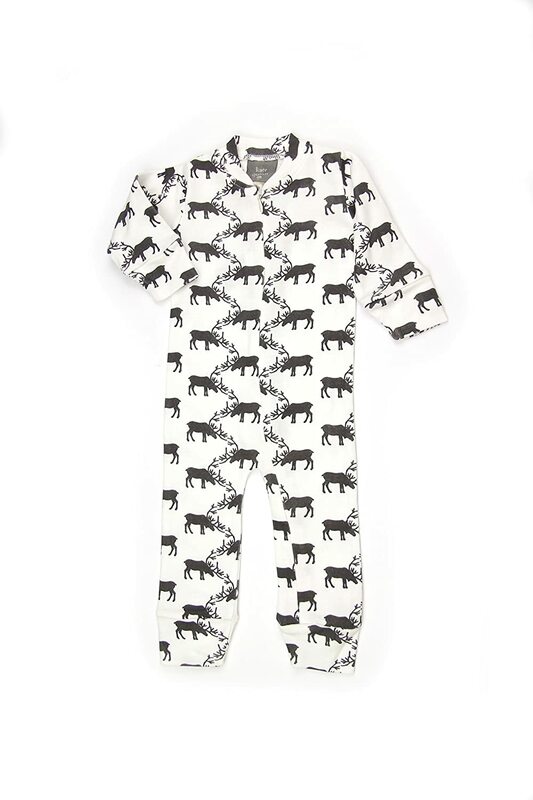 And Kate Quinn, Dordor & Gorgor, Lamaze Baby, and L’ovedbaby also sell organic footie PJs. 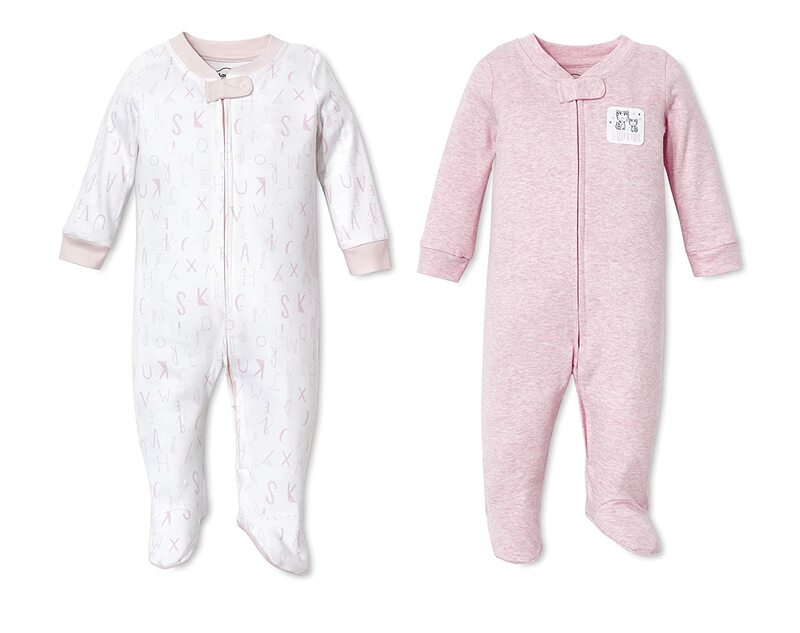 Synthetic fleece pajamas should always be avoided for newborns and infants because they are usually made from polyester (a synthetic fabric that is literally made from plastic) and therefore is not breathable. Have you ever slept under a fleece blanket or worn fleece yourself? It is easy to get too hot because it’s not breathable. Babies can’t self-regulate their temperature, so sleeping in polyester fleece pajamas or layers could lead to overheating. 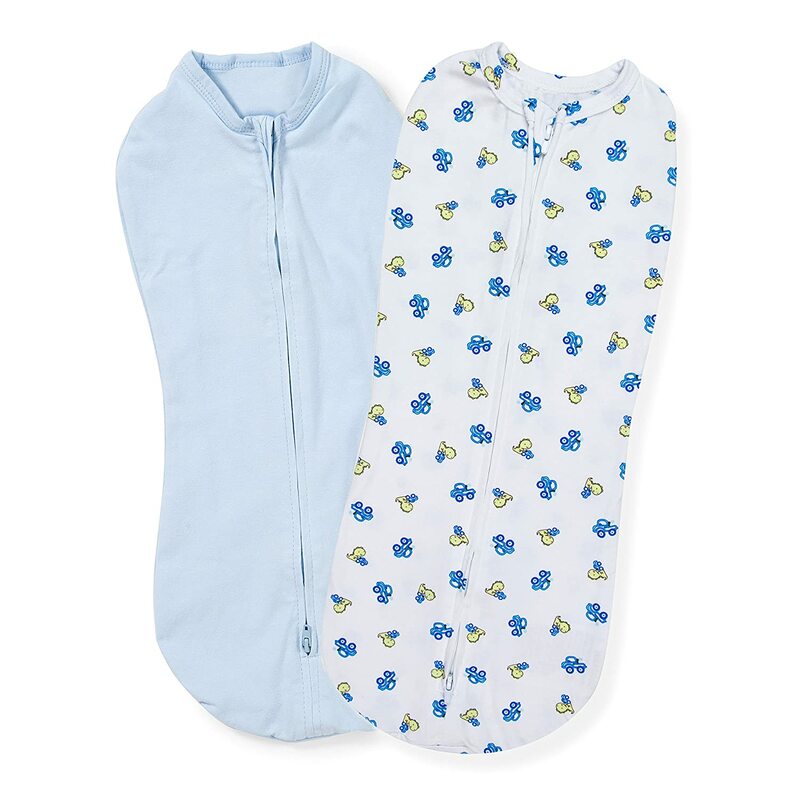 In addition to baby’s pajamas, you’ll likely want to swaddle your baby to help them sleep during those first few months. During the first three months of your baby’s life, aka the “fourth trimester”, she will still be adjusting to the world, and desperately still needs to feel the comforts of the womb. One of the best ways to help your new little bundle of joy get some sleep is to swaddle her for naps and night sleep. This helps newborns sleep better because it makes them feel snug and tight (just like in the womb), and it also helps control their startle reflex, which prevents them from waking up mid-sleep cycle. The mistake we made at first was thinking that our son didn’t like being swaddled, so we didn’t swaddle him. Rookie mistake! We just needed to try harder, and to be more confident in the swaddle. So, mamas, make sure you are confident in the swaddle and committed to it. Have plenty of swaddles on hand. You’ll need to replace them at least every time baby’s diaper leaks, and that will happen quite often. Not only that, but make sure to keep them in rotation so baby stays fresh. I recommend getting at least four blankets. Buy only the larger swaddle blankets. Make sure to get the 47” x 47” swaddle blankets. 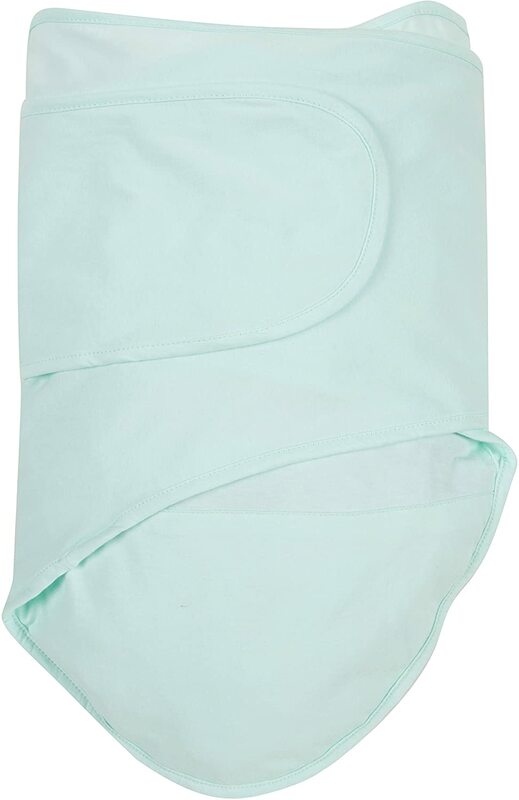 Any smaller and you won’t be able to get a good tight swaddle as your little one grows. Choose the right material. Whatever you do, don’t buy bamboo swaddle blankets! (Aden + Anais makes some of these.) They’re soft and pretty and come in lovely colors but they’re too soft, making them useless for swaddling. Save yourself the money and just get a set of the muslin swaddles. Muslin is a safe and breathable fabric for swaddling. You have many different options for swaddling your newborn, and we spent a pretty penny figuring out which swaddles worked best for our oldest baby. Before you start ordering swaddle after swaddle on Amazon (like I did) in an effort to find one your baby likes, keep in mind that most babies will resist being swaddled. They will do everything they can to convince you that they do not to like being swaddled. They’ll cry when you swaddle them. They’ll fight the swaddle. Our son used to wiggle his way out of his swaddle. 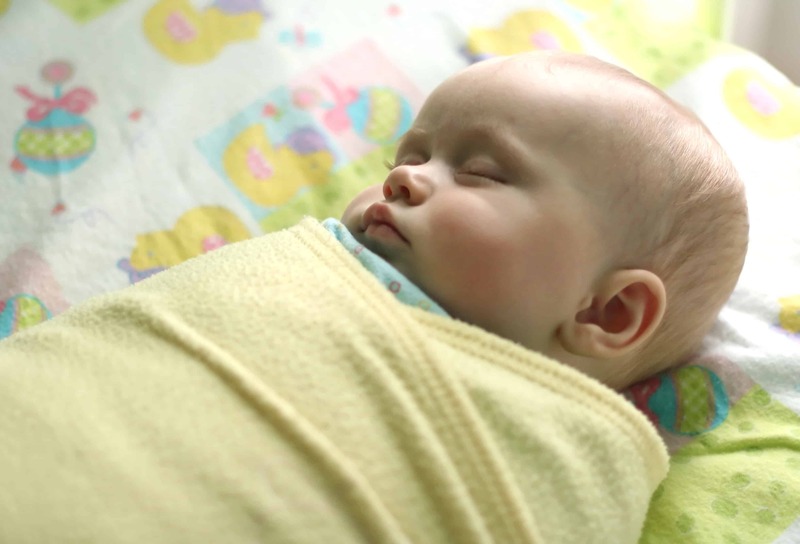 But, no matter how much they pout when you start bundling them up in a swaddle, it should help them sleep better if you do it safely and correctly. Muslin swaddle blankets are popular for a reason: they get the job done. At first, it’s hard to figure out just how to swaddle your baby with a thin little blanket. But with a little bit of practice, you’ll come to love these pretty (and functional) blankets. We tried the Aden + Anais Organic Swaddle Blankets, as well as the iPlay Organic Muslin Swaddle Blankets (which are hard to find now). I loved the iPlay blankets at first, but they got a little soft in the wash, which made it harder to keep a tight swaddle. So, I have to recommend the Aden + Anais brand. While these are made in China, they do offer an organic version and the fabric is GOTS certified, which is the way to go. 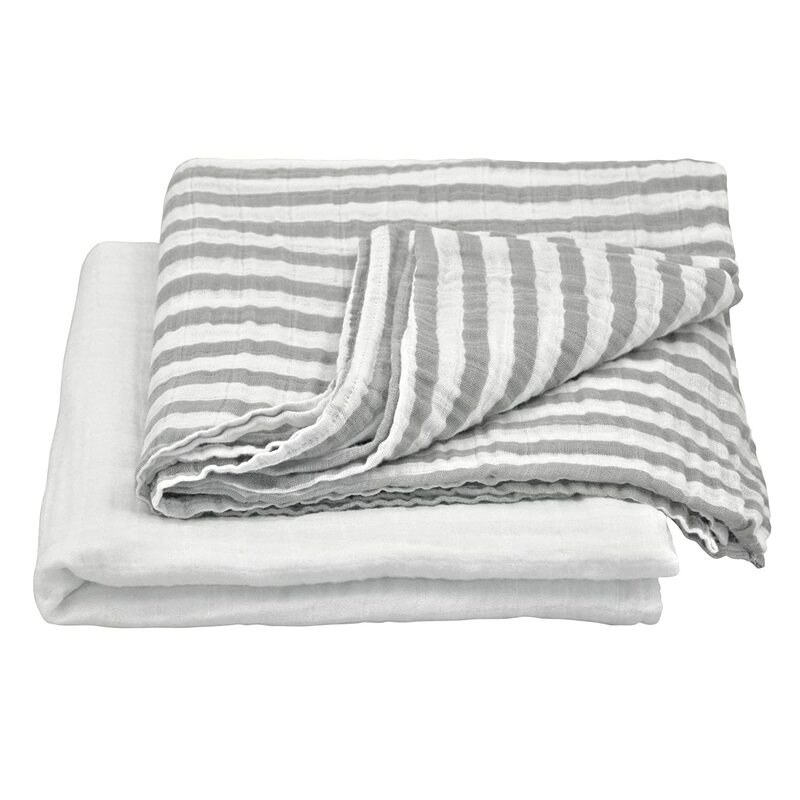 There are also several more options available: Margaux & May now offers an organic 47″ x 47″ swaddle blanket set too. Their designs are so pretty (but the blankets are also made in China). Virginia Kate sells a set of organic swaddle blankets, as does Bear Hugs, green sprouts, and WeeSprouts. The Woombie Organic AirWrap Vented Blanket is another interesting option. What I like about these is that they’re stretchy, organic, and breathable. What I don’t love is their size: coming in at 44” x 44”, they’re the smaller size swaddle. I strongly prefer the 47” x 47” (or larger) swaddle blankets. Any smaller than that, and you won’t be able to get a good, tight swaddle as your baby grows. Velcro swaddles are so easy to use and provide a snug sleep environment that’s tough for baby to escape from. I highly recommend having one or two of these on hand before baby is born, just in case your first-string swaddle (aka the muslin swaddle) isn’t doing its job and you need to call in some reinforcement. You might find that your little one prefers this to the muslin swaddle blankets entirely. These are also great for double swaddling your little houdini (but you should first check with your pediatrician if this is okay). 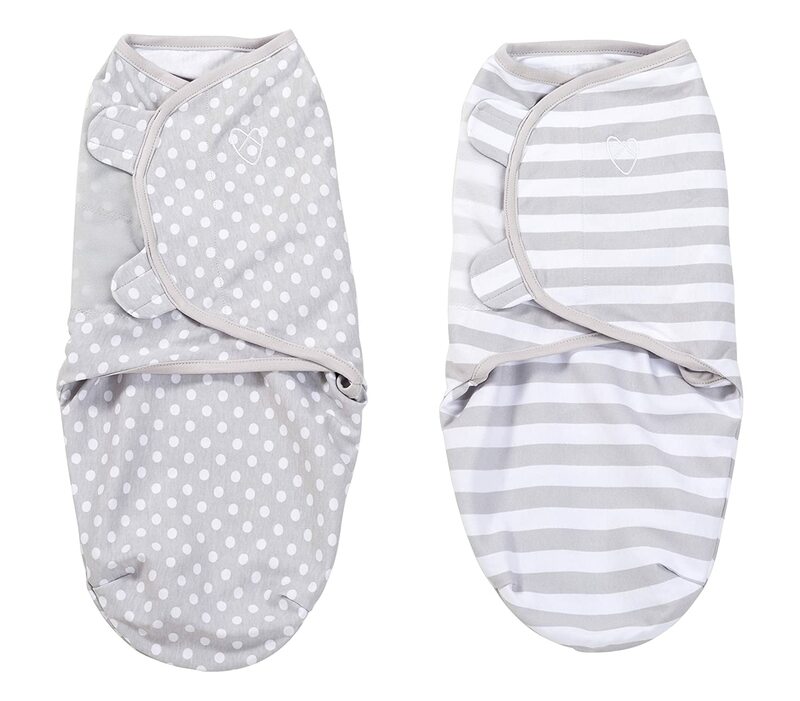 The Halo Sleepsack (non-organic) is a 2-in-1 adjustable swaddle that grows with baby during and after the swaddling stage. During the swaddling stage, it serves as a wearable blanket that allows you to swaddle baby’s arms and contain the startle reflex. 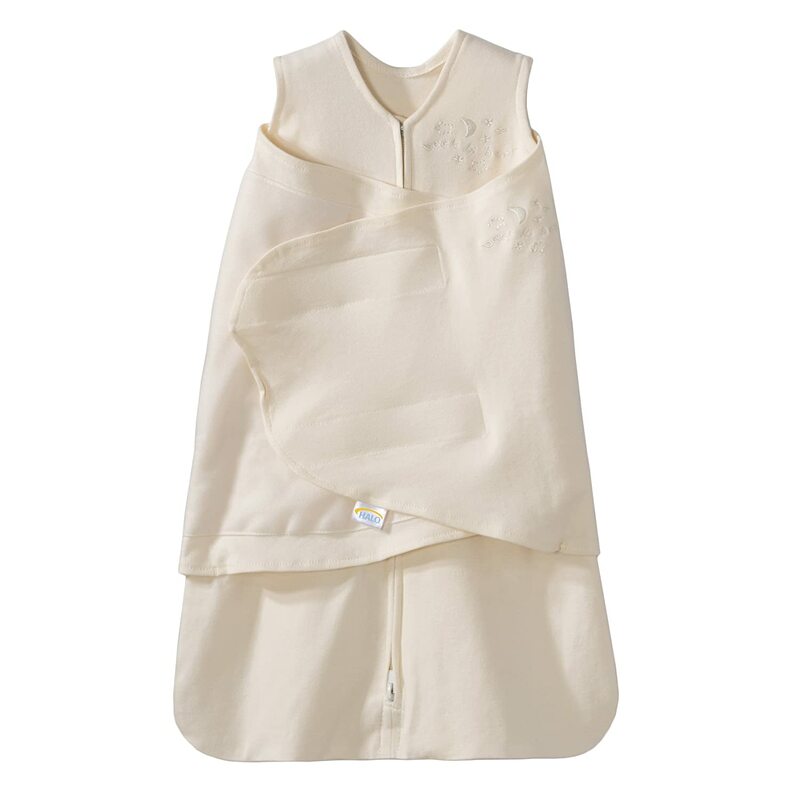 After the swaddling stage, the Halo Sleepsack can be used as a type of arms-out swaddle; this works well for babies because it fits snugly around their chest and tummy and gives them a feeling of comfort, or of being held. Unfortunately, they don’t offer an organic version at this time, and it is made in China. Wash it well if you do decide to purchase one. Also, if it works for you, you should have at least one extra on hand in case of diaper leaks. 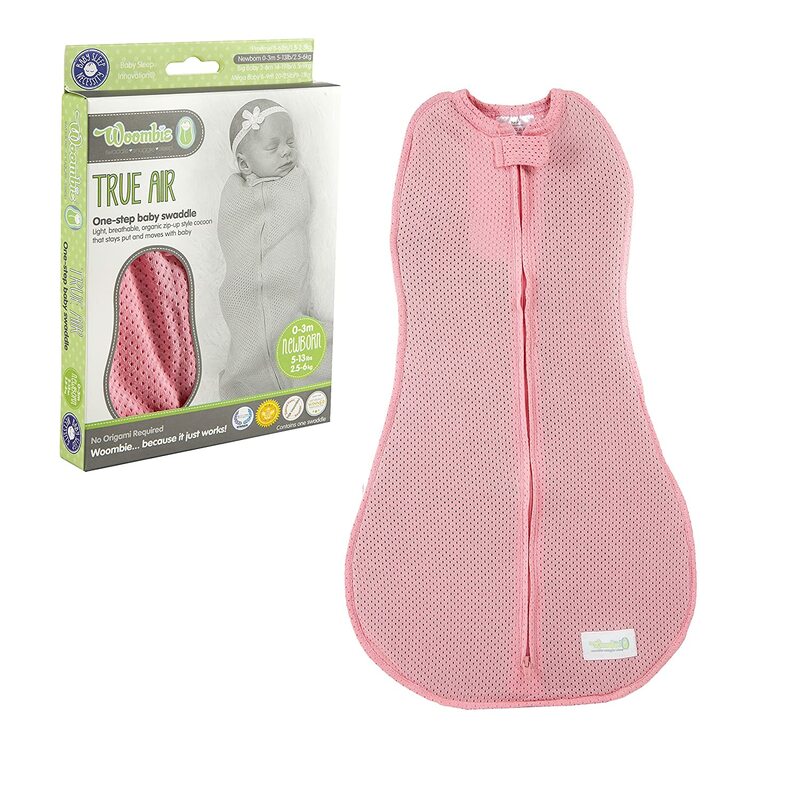 Consider the Woombie True Air Swaddle (organic) or the classic, non-organic version. It’s an awesome product! Here’s how it works: You zip baby up into a little cocoon-like swaddle that they can’t break out of. If it fits your baby well, you’re likely going to love this product. This is a great swaddling option and I encourage you to try it. We didn’t give this one enough time before ditching it, and I regret doing so because I’m pretty sure it would have been an awesome swaddle for our little one. The only design flaw I found with this product was that the neck was so snug that it made me a little nervous – hence, why we ditched this after only a few tries. (Again, I would recommend going with the organic version, since newborns spend so much time swaddled.) 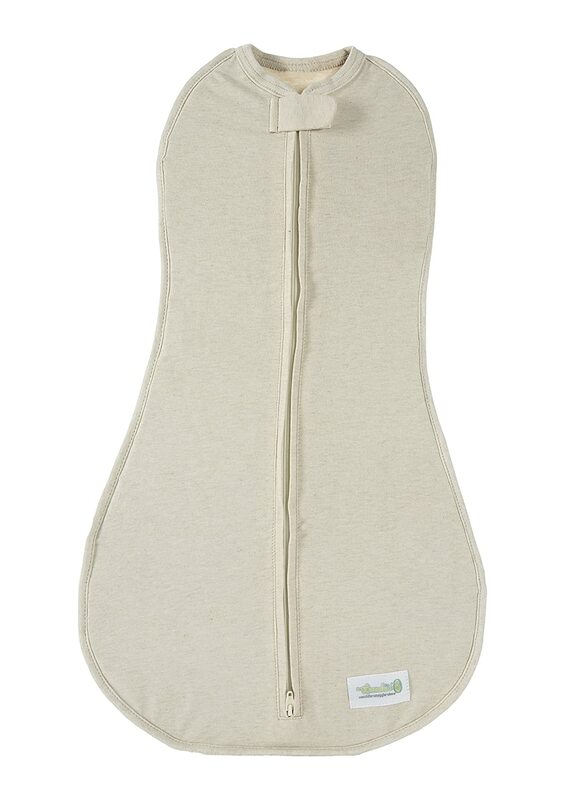 There’s also a Woombie-like product called the Summer Infant SwaddlePod (non-organic). It doesn’t look like they offer an organic version, but it’s a great, less expensive version of the Woombie. I hope you have found some great organic swaddler options for your little ones. Swaddling was tough for me, but I found that once I stuck with it, learned how to do a tight-enough (but not too tight) swaddle, and committed to it, it really worked wonders for my little one. 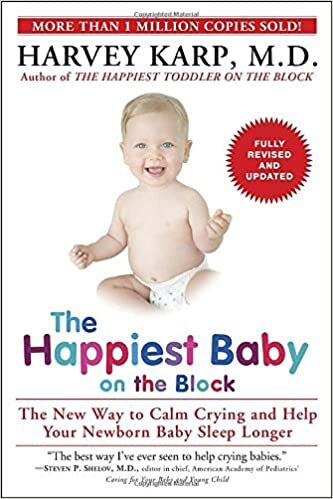 Also, if you haven’t heard about the Five S technique by Dr. Harvey Karp, I highly suggest you check out his book, The Happiest Baby on the Block, stream the video, or buy it on DVD. He talks about some great tools for helping baby sleep during the fourth trimester. If you haven’t already, be sure to also check out my organic layette guide. Thanks a lot for this great post! Was thrilled to find out about the wearable wool blankets – I didn’t know such a thing existed and I think that’s exactly what we’ll need for our cold Canadian winter!